I did the saute in my iron skillet, joined the rice and let it cool down to serving temperature. Didn't have green onions on hand, and the dish probably would have benefited from their flavor and color. Prepare brown rice in medium saucepan, following package instructions. About 15 minutes before the rice is done, melt the butter in a heavy skillet over medium-low heat. Add the onion and sauté, stirring frequently, until the onion is softened and begins to yellow, about 10 minutes. Stir in the garlic, pecans, and green onion; sauté over medium heat, stirring constantly, until the onions are golden and the garlic is tender, about 5 minutes. Remove rice from heat and let stand, covered, for 5 minutes. 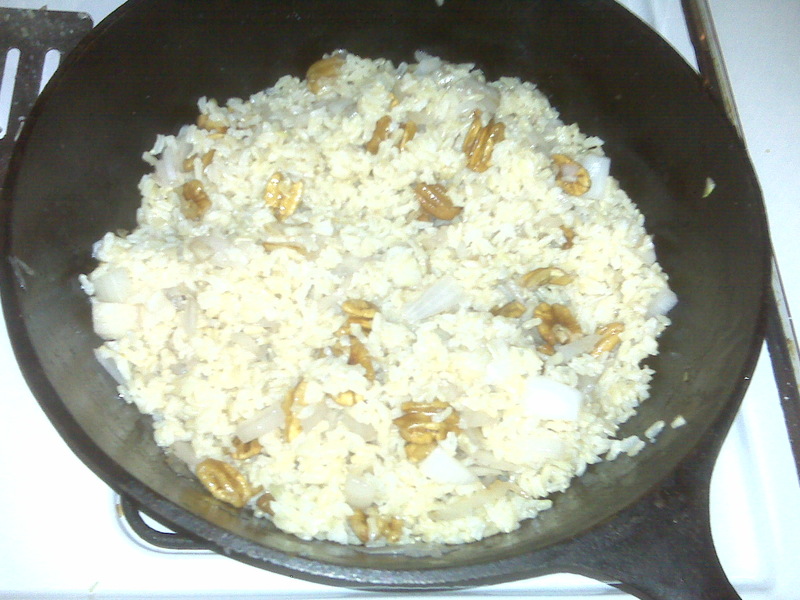 Spoon brown rice into a bowl; spoon the onions and pecans on top and toss lightly to combine. Garnish with the chopped green onion tops. Brown rice with onions and pecans serves 4.